So a friend of mine Jessica offered to hold a quilting learning bee. I happen to have a sewing machine that I got for high school graduation but have never used (other than Austin’s foray into tailoring). I think I shall call her baby Olga after my Baba. I have lots of t-shirts I can’t bear to part with. 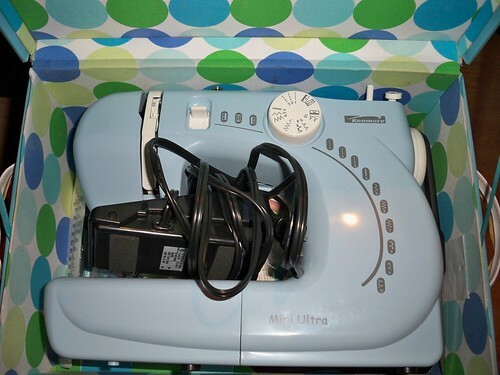 Quilting + Learning – Whole T-Shirts = T-shirt Quilt or EXCELLENT! First project is just piecing together some scraps. This is how Jessica taught me. 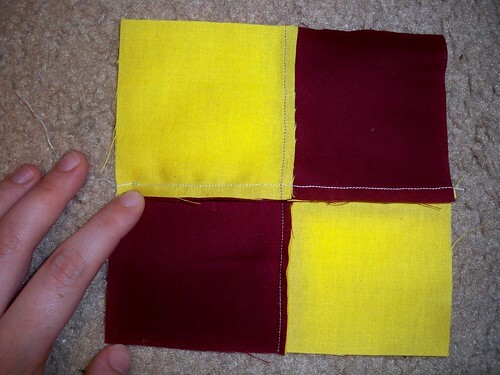 Cut out pieces of fabric, squaring off and leaving a 1/4″ margin on all sides for seams. Sew these together being wary of straightness of stitch and tension. 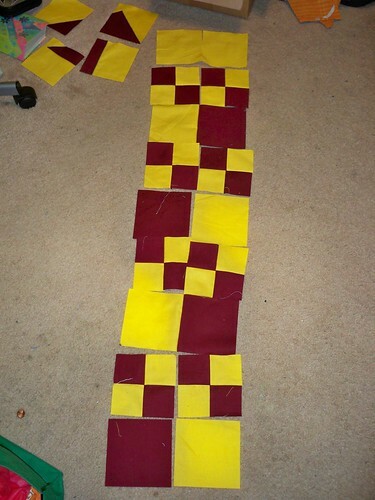 You can sew large strips together and then cut these to make your squares! Very handy tip. Lay out/plan your pattern (though you probably already had this in mind). Sew these pieces together keeping in mind that the seams are going the same way (ironing helps ascertain a set seam flappy direction). Sew together these blocks in bits. Combining these bits to make bigger bits. OILA! You have the front of an oddly Hogwartish Wall Hanging front. Still have to edge this off and put backing and all that fun stuff. 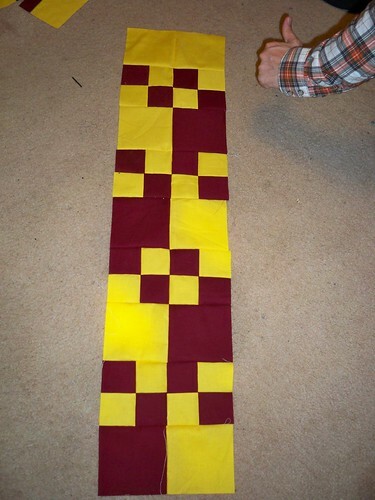 Next project I’m thinking a jersey/nerdy themed scarf, like this but scarfy. Need to get used to jersey for my big t-shirt quilt! Or I shall make a throw for my mask room. Mondrian style!